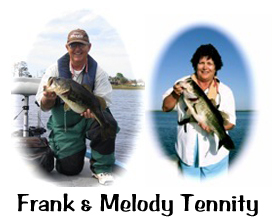 “It is difficult not to write in hyperbole when talking about going out fishing with Frank. A female friend and I had the pleasure of spending 4 days (24 hours) on the water with him this week taking his bass fishing seminar. We had so, so much fun and learned immeasurable fishing skills that we will be able to apply for the rest of our lives. Thank you, for the awesome fishing experience and teaching me about the wacky rig! The wedding was great, and we made it back to Illinois safely. Went out this morning fishing, used the wacky rig and caught: a large mouth, couple of smallies and a northern!!! I will be recommending your guide services to everyone I know!